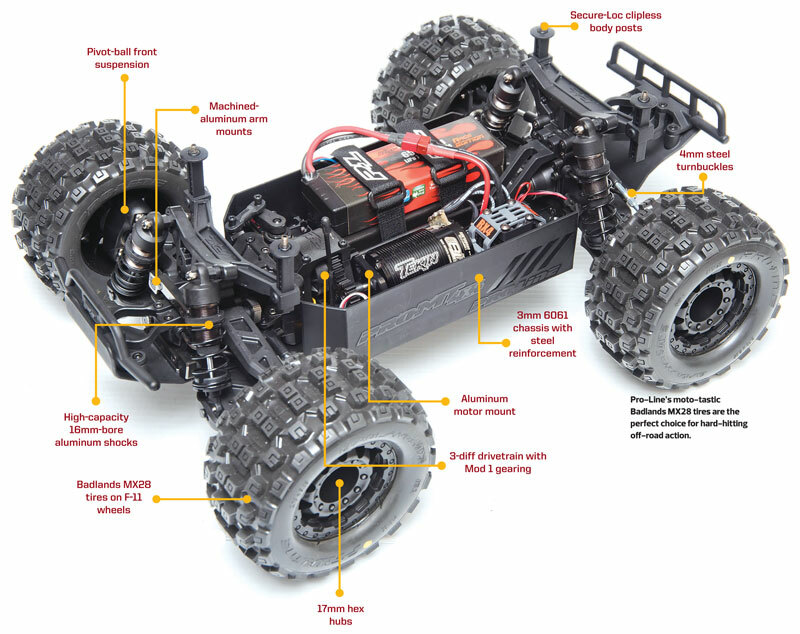 Pro-Line is the undisputed body, tire, and wheel king, and also makes a heckuva a complete RC car—go look up our reviews of the PRO-2, PRO-2 SC, and PRO-MT 2WD models to refresh your memory. And now the gang in Banning, California, is at it again with a new PRO model: their first-ever 4X4 monster. But unlike the 2-wheelers, the PRO-MT 4X4 is a clean-sheet design—no carryovers from the 2WD models, no parts that were originally designed as upgrades for other brands. 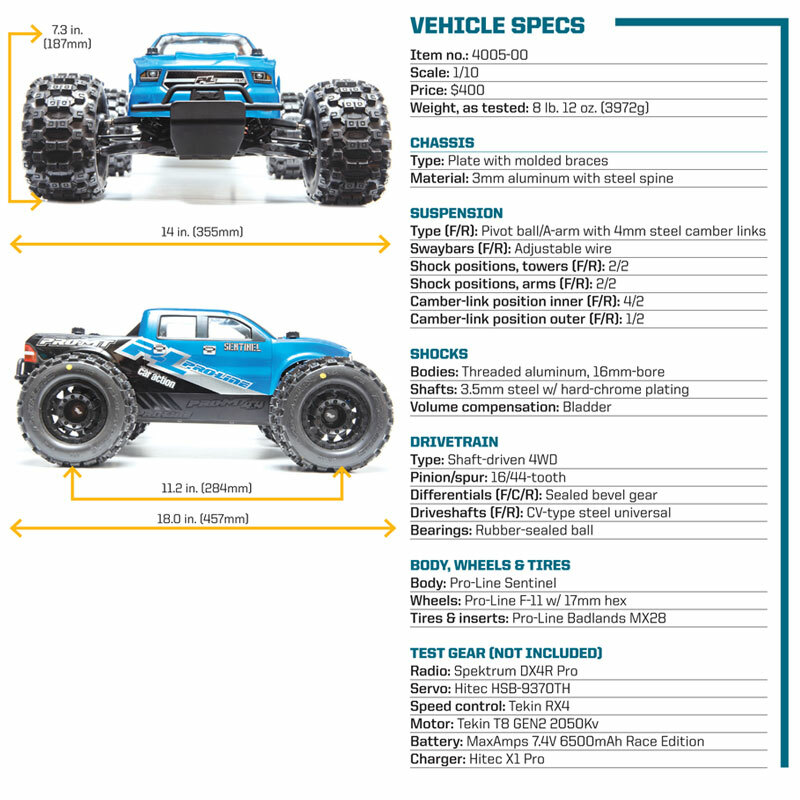 And Pro-Line didn’t skimp when ticking off features—you won’t find dogbones or plastic shocks or wimpy anything in this 4X4. 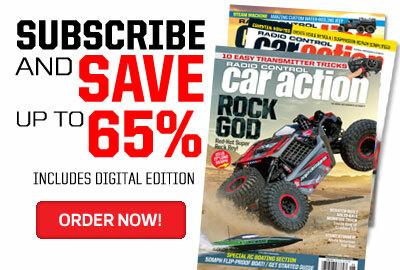 And while Pro-Line does build it for you, the electronics choices are left to you. Use stuff you already have or get a new high-output system—anything designed for 1/10 or 1/8 action will fit. 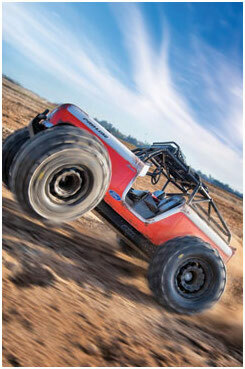 Pro-Line’s moto-tastic Badlands MX28 tires are the perfect choice for hard-hitting off-road action. 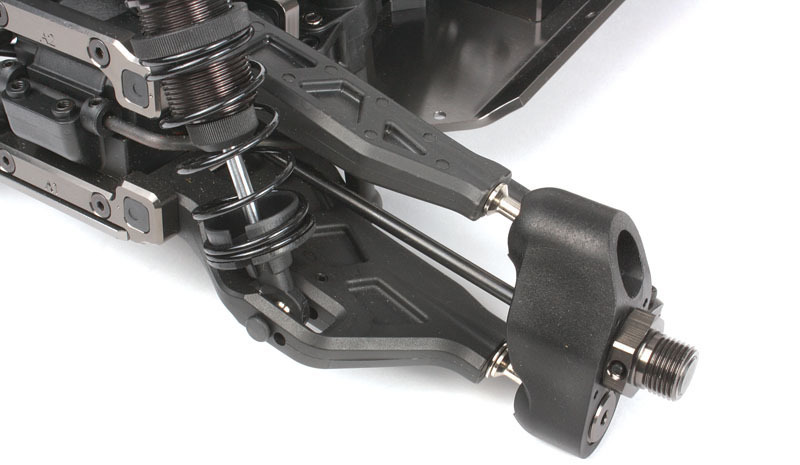 Stamped-aluminum chassis are a pretty standard feature for many RC trucks, but Pro-Line goes beyond a basic sheet design by upping the thickness to 3mm (instead of the more common 2.5mm) and adding a 3mm-thick steel “spine” that runs the length of the chassis. This, combined with conventional 1/8-buggy-style bracing, makes the chassis exceptionally strong without a bulky upper deck getting in the way. Tall mudguards also provide some reinforcement and hide the gap between the chassis and rocker panels when running lifted bodies. The MT’s aluminum chassis is reinforced by a steel spine—it’s that black strip running down the center. Ever had your gear mesh get squished too tight or kicked too loose after a crash? Pro-Line’s clever motor mount prevents that, and makes it easier to set gear mesh too. Plastic inserts position the motor mount for 14–21T gears and prevent the mounting screws from sliding in their slots. 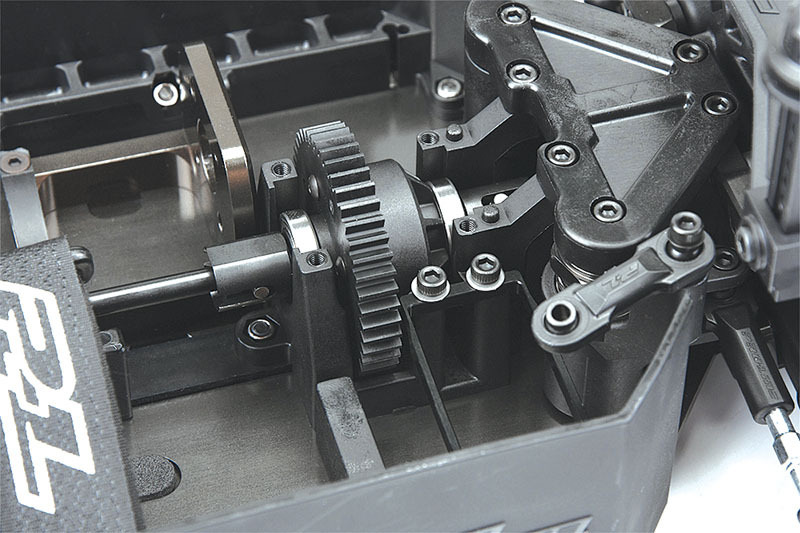 The mount itself is thickly machined out of aluminum and features an integrated support to take some of the strain off the motor’s mounting screws. The machined motor mount is drilled for 1/10 and 1/8 motors, and plastic inserts set gear mesh. something at speed. The rear end gets a conventional H-arm/camber-link setup, but the front end uses pivot balls for articulation. This allows easy camber and caster changes, and eliminates the stress points of hingepins and kingpins passing through a C-hub. Beefy. Pro-Line did not skimp when it comes to making thick, strong parts. 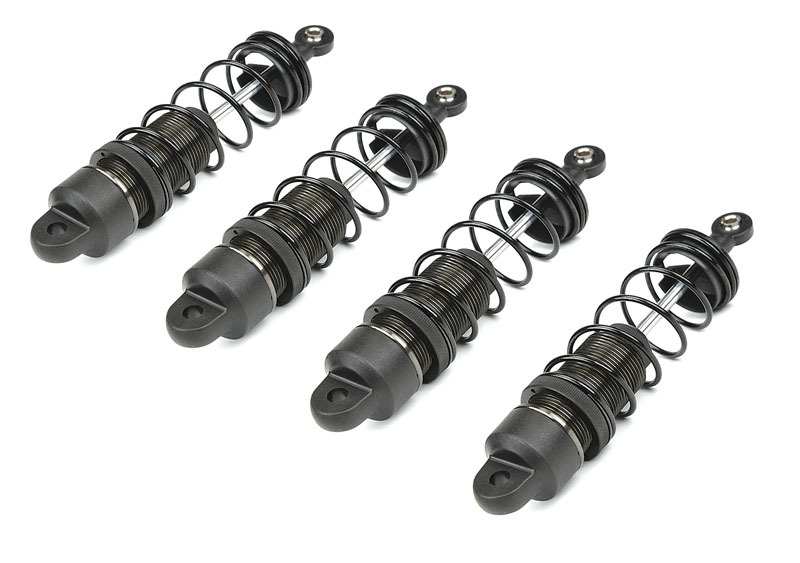 The big-bore shocks feature 16mm aluminum bodies, X-ring seals, and nutted Delrin pistons. Gotta have shaft drive in a 4WD monster truck, and Pro-Line obliges with a stout setup. All three diffs get four spider gears and hold silicone fluid, the front and rear gearboxes get metal ring and pinion gears, and the pinion and spur gears are Mod 1 metric pitch. That works out to 25.4 pitch—in other words, you’ve got big, broad gear teeth to hold up to whatever grenade you want to install as your motor. Steel CV-style universal-joint driveshafts are fitted front and rear, and the final stop is a set of 17mm 1/8-scale-style hex hubs. Grade-A beef throughout. What big teeth you have! The MT’s Mod 1 gears are build for heavy horsepower. 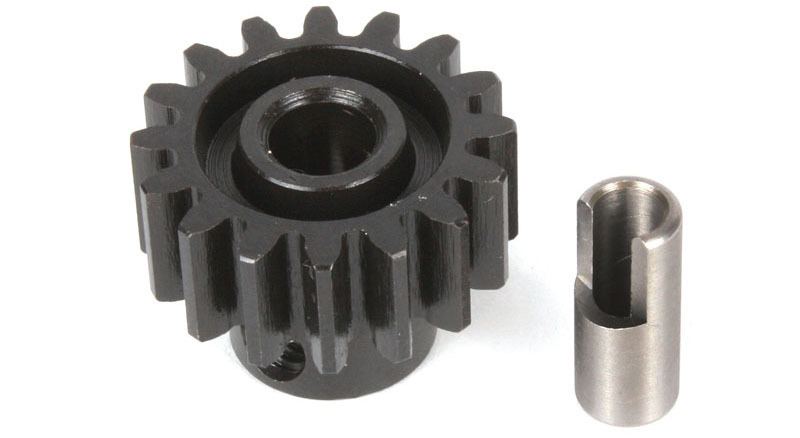 The supplied 16T pinion fits 5mm motor shafts, and an adapter sleeve is included for 1/8-inch shafts. The MT arrives with a perfectly good-looking Sentinel body, but when Pro-Line sent over a snap of the MT wearing the #3488 ’66 Ford Bronco body, we fell in love with the monster-Bronco look. 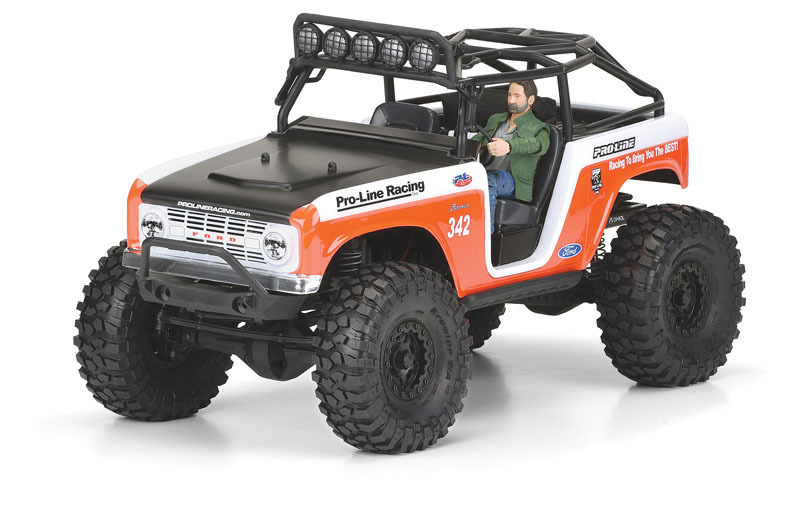 The body is designed for the Axial SCX10 Deadbolt (as shown here), but it lines up perfectly on the PRO-MT. And thanks to the generous amount of body post adjustment built into the truck, it’s easy to get the stance just right. The PRO-MT 4X4 can accept a huge variety of power systems, whether you’re recycling stuff from a 1/10-scale truck or going big with a 1/8-scale system. To really give the MT a workout, I went with Tekin’s RX4 speed control and T8 motor combo. The 2050Kv model is ideal for 4S power and suits the RX4’s 2300Kv motor limit (on 4S, that is—if you stick with motors of 1200Kv or less, you can go 6S). The RX4 is a sensored speed control, so throttle control is ultra precise. And since it’s a Tekin, it’s fully adjustable via computer or Bluetooth (and directly at the speed control, of course), and reliability is a given. RC Car Action: How long did it take to go from “let’s do a 4X4 monster truck” to the finished design, ready for tooling? Matt Wallace: The design and prototyping of the truck took a few months and was both a challenge and a ton of fun at the same time. The PRO-MT 4×4 is Pro-Line’s first true clean-sheet, in-house kit design not based on other platforms, so we put in a lot of time and thought into making it the best possible. Was it always a monster truck? 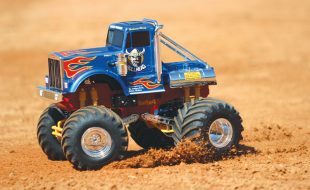 Was a 1/8 buggy considered, or a 4X4 SC truck, or something else? 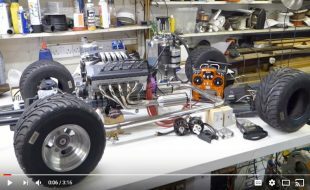 Yes, the project started with the idea of creating the most extreme and durable 1/10-scale 4WD monster truck in the industry, and we think that goal was achieved. 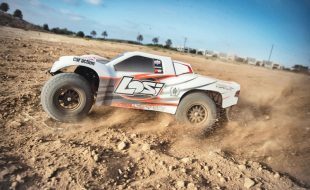 The original PRO-MT 2WD we released a few years ago gained critical acclaim, but the recurring feedback from Pro-Line fans was the desire for a 4WD version. This formed the basis for the PRO-MT 4X4. Now that the platform has been established, there is near-limitless possibilities of what the Pro-Line team might create in the future. What features or capabilities were considered must-haves? From day one, we knew the PRO-MT 4X4 would have to handle today’s crazy power systems—including 1/8-scale systems—right out of the box with no need for expensive upgrades. This was achieved by making several parts on the truck spec’d out like a 1/8-scale but in a true 1/10-scale overall size. We also knew the truck had to have an aluminum chassis, big-bore shocks, and the adjustable 3-diff setup. Everything else was designed to be as durable and easy to work on as possible. Pro-Line could have easily put existing parts from the other PRO models to work. Why go all new? 4WD is a different animal compared to 2WD, so we needed to step up the size of everything to achieve that next level of durability. 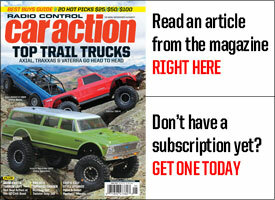 We have seen videos of what your readers do with their trucks when they are out bashing! The truck can accept a wide variety of power systems. What’s your favorite setup? We spent the most time testing the PRO-MT 4X4 with extreme power systems to make sure it could handle the abuse over the long term. This means we were using 4S LiPo batteries with a 1/8-scale-sized 1900Kv motors, which provided crazy standing backflips, unlimited wheelies, and extreme fun. A side benefit of using 1/8 motor systems is that you don’t have to worry too much about temps since the vehicle is fairly light for that amount of power and the motor is not getting overworked. But a typical 3S setup is more than enough for most people and still provides tons of fun. The truck is extremely tough. Do modern rapid-prototyping methods let you test for durability before you commit to tooling? Pro-Line stays on the cutting edge of technology, and we own the latest and greatest 3D printers to make sure we are producing the best products possible. We also have in-house manufacturing capabilities not typically found at most modern RC companies, and we used them to full advantage for this project. Those things, combined with our 35+ years of experience in the indus­try, allowed us to make one tough truck. Is there any chance we’ll see an RTR version? Any shout-outs you’d like to give to anyone else on the Pro-Line team? 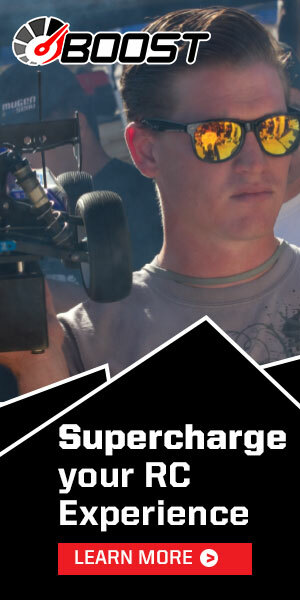 First, I have to thank all of the Pro-Line fans out there who inspire us to make the best RC products possible. Without them, we wouldn’t be able to do all of this cool stuff! 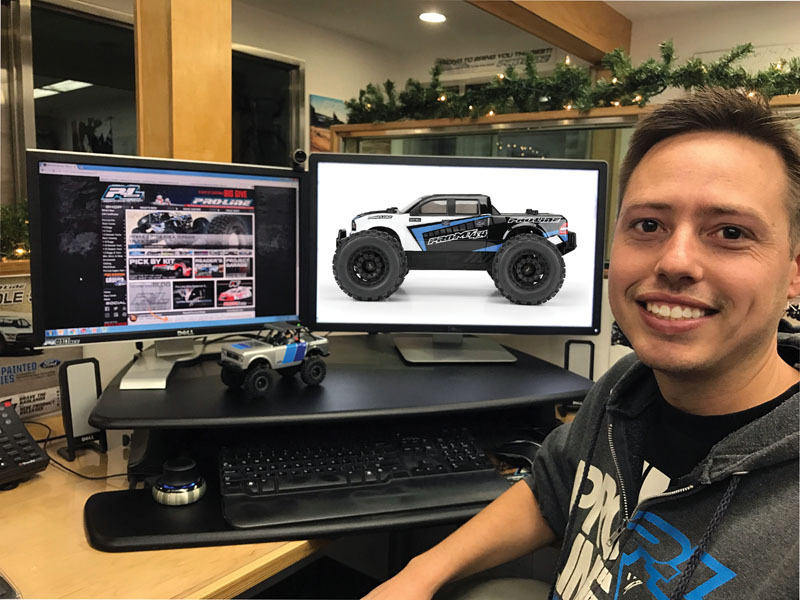 There is a ton of people behind the scenes at Pro-Line who make a project like the PRO-MT 4X4 come to life from all departments, including Engineering, Marketing, Sales, Videos, and Production along with our excellent suppliers. Pro-Line is truly an incredible place to work, and I’m blessed to play a small part in the success of the company. 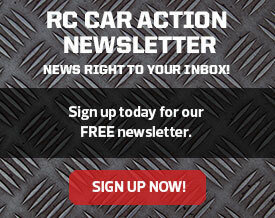 Special thanks to RC Car Action for giving me an opportunity to talk about the PRO-MT 4X4. 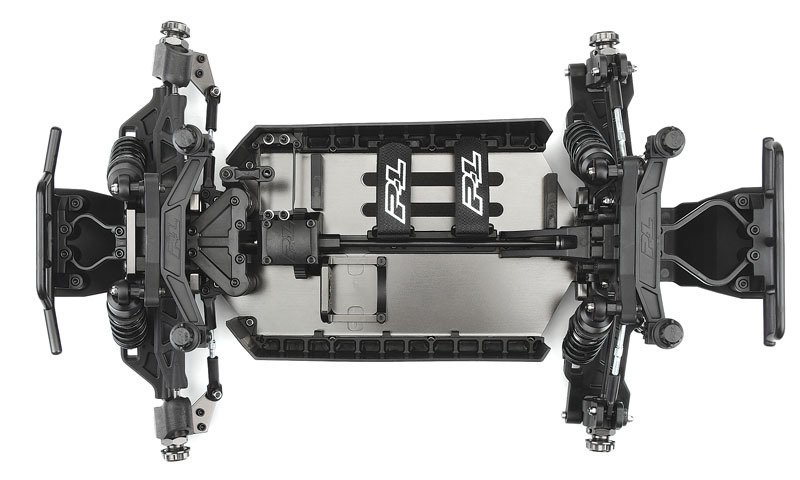 Installing the Tekin, Spektrum, Hitec, and MaxAmps gear selected to complete the PRO-MT 4X4 was easy, as Pro-Line designed the chassis to accommodate a wide range of setups. The manual covers the basics of installing the radio gear and a power system, but any experienced RC’er will already know what goes where (exception: setting the spacers to match the pinion size. Look at the manual!). Finishing off the factory-trimmed Sentinel body is as complex as you want to make it, but even a 15-minute spray bomb can look good thanks to the included window masks, overspray film, and decals. Pro-Line does a good job of building the MT as a roller, and there was nothing to fix or touch up before hitting the dirt. As with any monster truck, the MT’s performance is very much a tire-and-suspension story, and the truck shines on both fronts. The Badlands tires may be RC’s best-looking truck treads, and they move dirt as ferociously as the motocross rubber they’re patterned after. Pin the throttle in loose terrain, and the Badlands will roost hard until they find something to grab onto. On hard-pack, they just dig in and go. There’s forward-bite and side-bite galore (watch out for traction rolling), and the big lugs are also happy on grass and pavement. 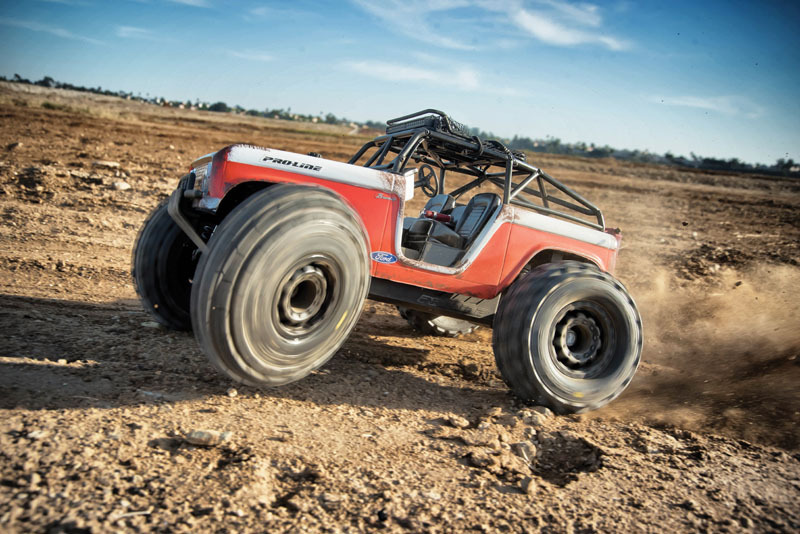 The MT makes the most of its 1/8-scale buggy-style suspension, and the big-bore shocks combined with the cushy Badlands tires go a long way in smoothing the ride. Front and rear swaybars didn’t seem to impact the suspension’s suppleness, and do help the truck feel “neutral” in turns. Be ready for the front wheels to come up when you mash the trigger, especially if you go big in the power department. Pro-Line fills the diffs with silicone for you (100,000 wt. in the center, per the manual), but the diffs can still unload if you’re a real hammer. You can always install thicker fluid, and diff access is easy. When it’s time to leave planet Earth, the MT is a capable jumper. You’ve got 4WD with big gyroscopes (the wheels) on each corner that make the truck very responsive to throttle and brake for flight corrections, and re-entry is capably soaked up by the super-sized shocks. The truck encourages ever bigger launches and the inevitable wrecks that come with the territory. The MT took the abuse in stride and didn’t lose so much as a body clip (of course, it helps that the truck doesn’t have body clips. Love those Secure-Loc body posts…). Well done, Pro-Line. The PRO-MT 4X4 is a bunch of fun and tougher than a $2 steak, which is exactly what a monster truck should be. The other big part of the MT’s appeal is what it isn’t—and that’s an RTR. Nothing wrong with RTRs, of course, but RTR (usually) means more plastic, less metal, and factory electronics that may be less capable than what you really want. 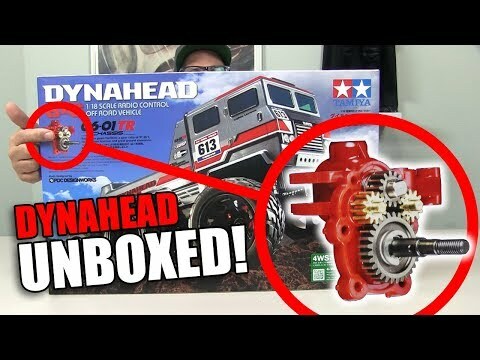 The PRO-MT 4X4 spares you from pulling out a perfectly good RTR power system to spend more money on something else, swap plastic shocks for aluminum, etc. 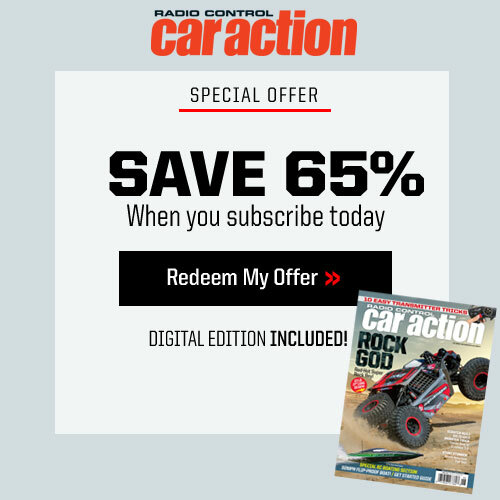 You’re getting premium, pro-grade race specs (and 1/8-scale-buggy toughness) in a model that just happens to be a monster truck instead of a competition car. And at $400, it’s actually a bargain compared to upgrading an RTR monster to match Pro-Line’s specs. If you’re looking for the ultimate 1/10-scale monster truck, this is it.